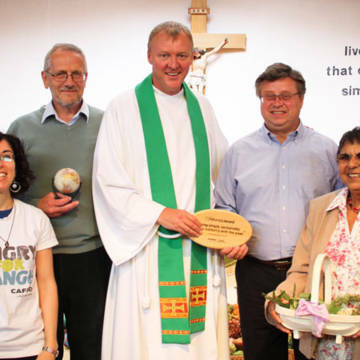 Earlier this month, parishioners at St John’s the Evangelist, Bridgnorth, were the recipients of CAFOD’s 40th livesimply award. They were presented with the award for championing sustainable living. Their efforts focused on promoting a simpler, greener life style in solidarity with the world’s poorest communities. St John’s the Evangelist is the first church to gain the award in the Shrewsbury diocese. Living simply: The parish organised a Laudato Si’ study group to inspire parishioners to live a simpler and greener lifestyle. Along with the study group the parish also offered a livesimply mass and created a livesimply check list which all parishioners received after mass with actions to care for creation. The local catholic school, inspired by the livesimply check list, created an Advent calendar with daily actions. Living sustainably: The group of 30 active members split into smaller groups to encourage several initiatives. These included creating a contemplative meditation garden at the side of the church and planting trees to mark significant events like sacraments, death, anniversaries. They also organised a litter picking project in the community and a plastic bottle top collection for the local children’s hospital. Living in solidarity: The livesimply group promoted CAFOD World Gifts at Christmas and the sale of Traidcraft Christmas cards in partnership with St John’s primary school. More recently they organised a Share the Journey walk in solidarity with refugees. Mary, who led the livesimply group, said: “We were delighted to receive the award but also humbled as we realise that more needs to be done to move us forward and make a difference. We are extremely grateful for the support we have received from across the parish and from Fr Iain, our Parish Priest”. How can I/we start championing sustainable living? The livesimply award is open to all Catholic communities - parishes, schools, religious orders and chaplaincies. It is given to communities that have taken significant steps to respond to the Church’s call to live simply so that others may simply live. It helps communities to celebrate achievements and gives the focus and inspiration to go further and become a sustainable living champion. 1- Explore our livesimply resources and share the idea with others in your community. A small enthusiastic group, whether an existing CAFOD group, a Justice and Peace group or a handful of people ready for a new challenge, is all you need to get started. Be sure to get the backing of your parish priest or head teacher. 2- Sign-up to livesimply as a parish. When you sign-up we’ll invite you to an email group for livesimply communities. This is an easy way for communities to share ideas and resources, and to help you to complete an action plan. Alternatively call us on 0303 303 3030. 3- Complete an action plan. Use our simple action plan template to detail the sustainability activities in your parish and begin your journey to becoming a livesimply parish. The livesimply award enables you to strengthen the bonds of community, nourish your spiritual life and care for God's gift of creation.